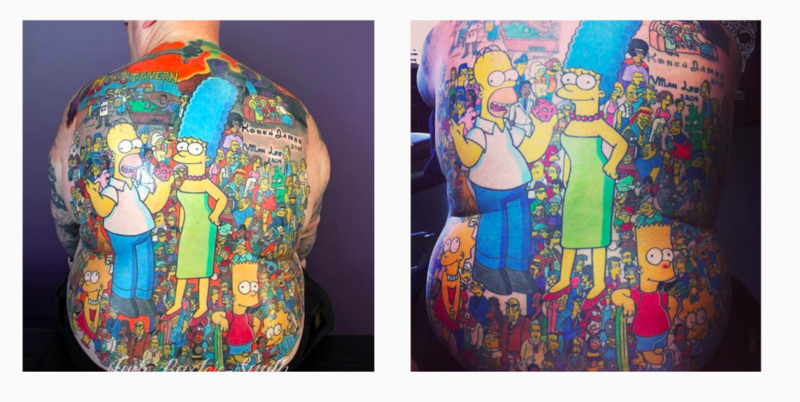 Baxter, 52 and of Australia, has 203 Simpsons tattoos on his back. The whole piece features major characters, minor characters, and iconic images from the Fox series, including Moe’s Diner and Homer’s infamous donut. The tattoo process, which started around two years ago, took over 120 hours and $12,000 AU (about $8,493 USD) to complete, Guinness World Records reports. Jade Baxter Smith, Baxter’s tattoo artist, Instagrammed a photo of the finalized tattoo on October 17, 2013, but it wasn’t until recently that Baxter was confirmed as the bona fide, record-breaking cartoon tattoo holder. In order to be awarded the title, “all of Michael’s tattoos had to show the characters as they appear in the animated series, and Baxter had to provide details of the episode(s) in which each character appeared (in the form of which they have been tattooed),” Guinness World Records stated. “I love the tattoo, and I know lots of other people, including my grandchildren, do, too,” Baxter said. The question you’re probably asking yourself is: Why did he do it? “I wanted to get something which was unique, which nobody else had or would even think of getting,” Baxter told Guinness World Records.